The highly persistent nature of Mycobacterium tuberculosis can be attributed to its lipophilic cell wall which acts as a major barrier in the process of drug discovery against tuberculosis. Glutamine synthetase plays a major role in nitrogen metabolism and cell wall biosynthesis of pathogenic mycobacteria. The current review focuses on the structural and functional aspects of Mtb glutamine synthetase and an overview of its reported inhibitors till date. Also in the present study, we employed a computational structure based drug design protocol for identifying novel inhibitors against Mtb glutamine synthetase (MtbGS). A total of 12 hits were identified based on e-pharmacophore related search and virtual screening, which were further tested for their in vitro MtbGS inhibitory activity. Three compounds (compound 6, 1 and 12) were found with IC50 less than 5 µM, of which compound 6 being top active with IC50 of 2.124 µM. Differential scanning fluorimetry studies were employed so as to measure the thermal stability of the protein complexed with the most active compound. Also the protein complexes with top three active compounds were subjected for molecular dynamics simulations to study their binding pattern and stabilization effect. 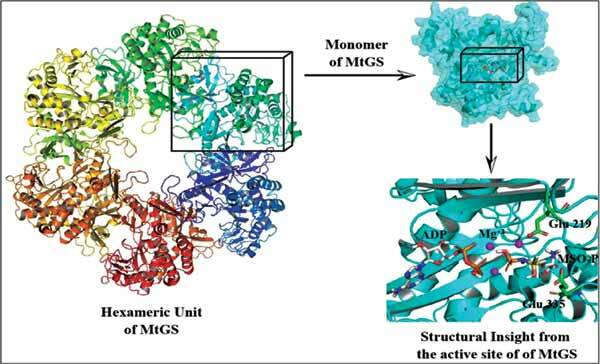 The solvation free energies were also determined for these compounds, undertaking free energy perturbation studies, which can be used further for lead optimization in the process of anti-tubercular drug discovery targeting Mtb glutamine synthetase. Glutamine synthetase, E-pharmacophore, Differential scanning fluorimetry, Molecular dynamics simulations, Solvation free energy. Computer aided drug design lab, Department of Pharmacy, Birla Institute of Technology & Science- Pilani, Hyderabad Campus, Shameerpet, R.R District , Hyderabad-500078, Telangana, India.